There are two ways that I can get to work. One is through a chic, clean boulevard called Platinum St. But what’s the fun in that. I usually take the dodgy back alley way. Not only is it a few minutes quicker, it also has some sights rarely seen in hyper tidy Tokyo, like graffiti, litter, and homelessness. 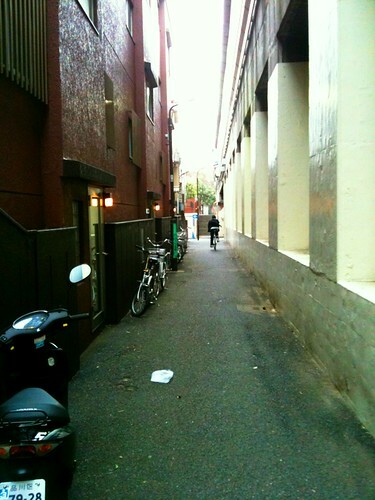 Although, the alley may be dodgy by Japanese standards, it’s probably safer than any neighborhood in the US. For one thing, it snakes through a very wealthy neighborhood. But because it’s wedged next to a highway, there is a creepy industrial vibe about it. My favorite spot is this dilapidated wall and door. About two years ago, a section of the wall was removed to accommodate the growing roots of the cherry tree. Or maybe it just collapsed. I’ve never seen anyone enter or exit that door. The whole wall would probably crumble if anyone opened it. Even though the neighborhood is wealthy (the parking garages are filled with luxury SUVs), you can still come across a flimsy shack that belongs in a third world shanty town. This particular home is owned by someone who predates the gentrification of the area, an old guy who smokes a pipe and glares at passers-by. 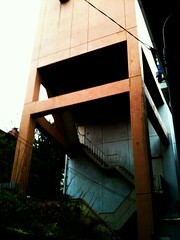 The most curious structure along the alley is a huge concrete tower. I assume it has something to do with the operation of the highway. 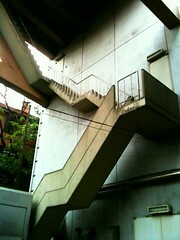 I like how Escherian it is, with a staircase apparently leading nowhere. There’s always a construction crew doing something, with a trailer to house the workers. 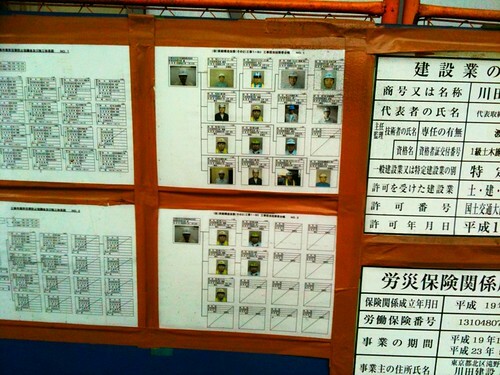 Maybe for security reasons all the workers are identified on this board, with their job titles and what they’re supposed to be doing. Most of the homeless in Tokyo congregate in makeshift settlements in the city parks. Every now and then I see one sleeping in an alley in a sleeping bag. But I’d never seen an umbrella shelter before. Discarded broken umbrellas are everywhere after a storm and this guy made good use of the resources available to him and basically created a geodesic dome. I think it’s ingenious. 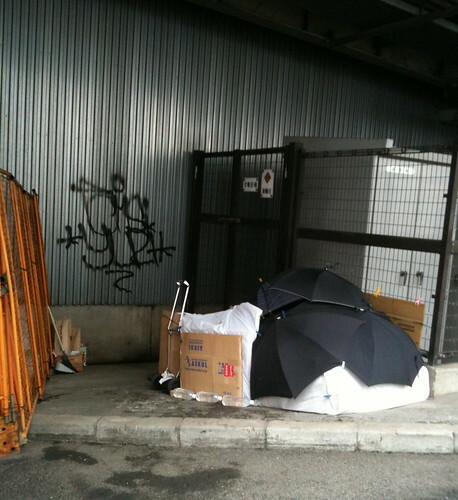 The umbrellas are reinforced with plastic and cardboard. Water bottles are used as foundation weights. His shopping trolley also doubles as a structural post. And every morning he takes it down and neatly stacks everything in the corner. During the winter I use these heat pads to warm my back. They rock. Placed on your lower back, these things keep the whole body warm for 24 hours. I only use it when I’m feeling back pain but I always have one in my bag just in case. On days when I didn’t have to use it, I dropped off the heat pad outside the umbrella tent on my way home. Since it was a relatively pain-free winter, I dropped off a lot of heat pads. After a while, he figured out I was his heat pad Santa. At first, he bowed if he saw me. Later, we had brief conversations. His name is Mr. Ohara and from what I could understand he moved to Tokyo from Niigata to be closer to his daughter’s family who live nearby. They don’t know he lives under a highway. He doesn’t want to burden them. Sometimes when I pass by he doesn’t seem to recognize me. He strikes me as a modern day hermit monk, renouncing worldly possessions, except for his umbrellas of course. 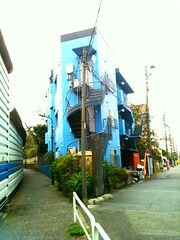 This is a shot of a very narrow apartment building. 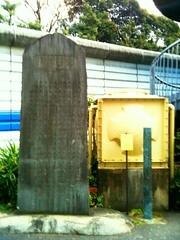 What’s interesting about it is the bright yellow water tank placed next to this stone monument. 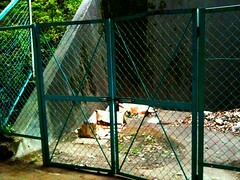 There are many fenced in areas. Some seem to be fenced in for no reason. There’s nothing in the picture on the left except trash. 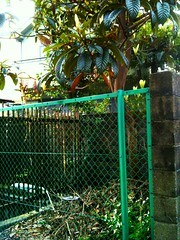 Others, like the one on the right, a loquat tree grows. It produces a lot of fruit in the summer. Many of these areas protect an underground tunnel that probably leads to the other side of the highway. There’s also another fenced yard that seems to be privately owned. 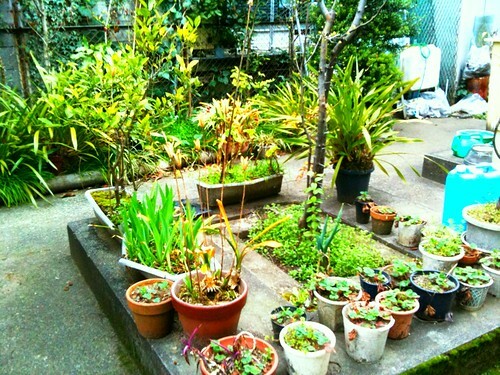 It’s a garden filled with old appliances and bath tubs with plants and ponds. Then there’s the graffiti. About once a year a crew comes out and paints over the entire alley. 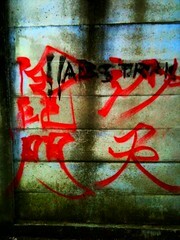 But it doesn’t take long for taggers to come back and make their marks. The writings are kind of nonsensical. 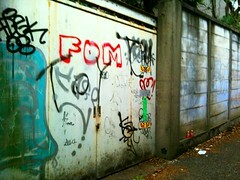 I assume they’re the tags of some bored teenagers who fancy themselves a gang. It’s not that I’m particularly fascinated by the dark seedy underbelly of life. Well maybe a little. But I would hardly call this alley that. Maybe it’s just that in perfectly orderly Japan, I feel a little more relaxed, maybe relief, walking through a little neglected corner of disorder. 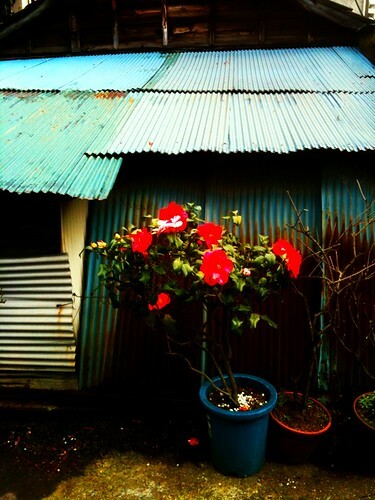 Thank you for sharing this wonderful tour of your neighborhood alley. I love it, and you describe your journey down it such an engaging and attentive way! 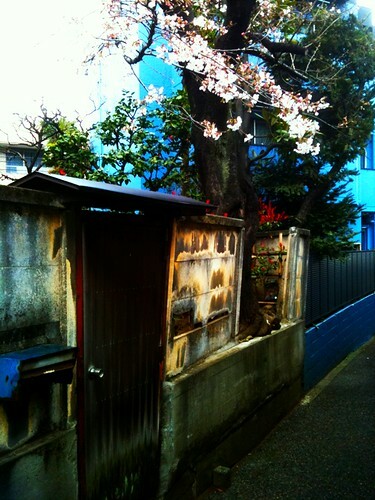 I feel like I’ve gotten a glimpse into a piece of your world, your life in Japan. 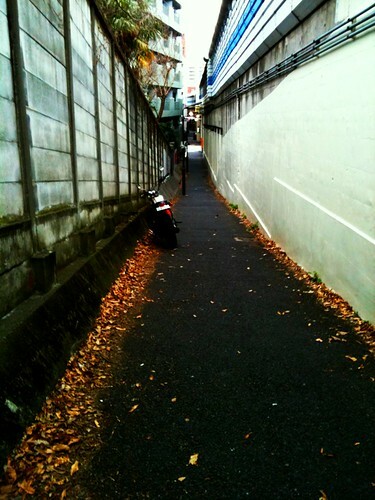 It makes me miss my own alleyway back in Kawanishi-shi, and it inspires me to document a little piece of my own world. thanks sheldon! and i really encourage you to blog. i remember enjoying your writings so many years ago. There are so many interesting elements in this post but the story of Mr. Ohara and his umbrella tent is what makes it extra special. I hope he’s doing ok.
i think he’s doing fine. he even had some company last time i passed by. 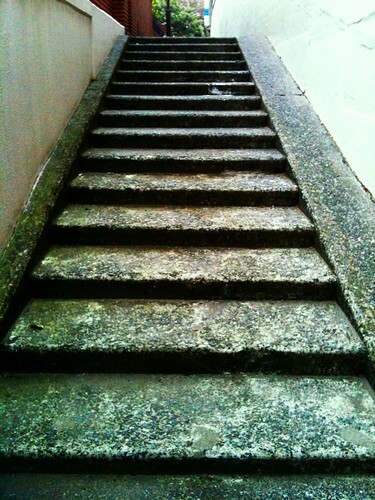 the alley is quite a contrast to your ‘neighborhood’. definitely not as beautiful. Really great stuff Wind! These are nice, interpreted glimpses into Japan from someone with a different perspective. How enlightening, especially around homelessness in Japan which is surely an issue that we’ll never hear about on the news. My current neighbourhood is quite different though there are a lot of seniors suffering silently and missing their far away children and grandchildren. Your geographer friend finds this most fascinating. i think more people should do a ‘survey’ of their neighborhoods. go get your blog up so i can read about it! Ha ha ha. Oh I will. I will. Your geographer friend is also your procrastinator friend.